The Bhagawath Gita in its prelude states through the following sloka:- Om parthaya prathibhodhitam Bhagwatha Narayanena swayam Vyasena grathitham purana munina Madhye Mahabharatham| Advaithamrtavarshinim bhaghawathim Ashtadasadhyayinim Amba twam anusandadhami bhagavathgite Bhavadvesinim | In short, the Gita shows with clarity through its 18 chapters the path to attainment of higher altitudes of living to those who have the urge to achieve that Bliss and are prepared to bear high burdens while doing so! Astrology too aims at the same target. In its 13th chapter the Gita, through the following sloka enumerates in short the main 24 ingredients that lie in the path of a human being to achieve that Supreme Bliss which he is capable off:- Mahabhuthany ahamkaro buddiravyaktam eva cha I Indriyanidasai kam cha pancha cheindriyagochara II Iccha dweshah sukham dhukham samghatas chethana dhrithi I ethat Kshetram samasena savikaram udhahritham II Mahabhuthani : The ﬁ ve Elements that constitute the resource for the functioning of the human system, be it constructive or otherwise. Ahamkara : The inner egoism that travels with the human being from the minute he/ she realizes Dwaitha or Relativity. Bhuddir : The intellect or organ for gaining the inﬁ nite knowledge, be it for good or for bad. Avyuktham : The unmanifested. This can relate to The Supreme Power who is not directly visible to the normal human being. It can also mean the superﬁ cial pleasantness that the human being is prone to get cheated or blinded by. Indrianidhasaikam : The composite ﬁ ve sense organs (Jnana Indriyas) and the ﬁ ve organs of action (Karma Indriyas) – each dependent on one another in the daily walk of life journey. Panch indriyani gochara : The external environment is cognized and interpreted through these organs and therefore form the important ingredients to the actions taken by an individual. Iccha : Actions instigated without prior planning to achieve what is known as Desire. Obviously it leads to failure and consequent distress. One should have high aspirations but not desires. Dweshah : Hatred and jealousy leads to dissipation of internal energy. Sukam : Pleasure is transient in nature and can easily cause destabilization of the human working system. Dhukam : Pain mainly caused by impulsive and overt actions and repentance thereof. Sankyath Chetana : The Intelligence stores the aggregate of all these negativities and its actions are a consequence of it. Dhrithi : Fortitude or adamancy. The failure to adjust to the other’s good thoughts and deeds. It includes the positive urge which in turn stimulates the working system and subsequent development of will power and self – conﬁ dence. These 24 ingredients form in short, the in- roads to the working of the Human system. Astrology : It is well known that the ‘Panch Bhuthas’ are the main source of energy development and utilisation for the Human Being . Both the mental and physical health of Oneself, is largely dependent on these resources for its successful journey in this life. However in the present system all these natural resources are highly polluted due to man– made gadgets or human maloperation, while incident upon the human being. These above ingredients are universal and cannot be fully controlled by the Individual. It therefore remains that One should use his/her individual working system to overcome these negativities and modulate it to create a sustainable and optimal growth for oneself. As each individual is unique by itself, different modes would be required for each individual. It is here that Astrology, which analyses the individual’s potential and working capability, comes to the rescue. The Vastu oriented placement of the planets in the conglomeration of Navagraha in a Hindu temple clearly indicates the intimate relationship the ‘Panch Bhutas’ have with the planets and its inert capability through solar radiation powers to modify the harmonics incident on the energy inﬂ ow of an individual to enable betterment of One’s mental and physical growth. It is well known that solar energy is the crux for all living beings. The tidal waves are governed by the Moon’s movement from the No Moon to the full Moon and back to No Moon. This is known as ‘Tithi’. 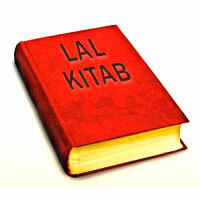 About 70% of all individual system consists of liquid or “Jal Tatwa”. Proper use of the Sun and Moon combination as per One’s natal horoscope could greatly improve the operational function of all human beings. While eclipses which are high energy resources are formed when the linear axis of the Sun and Moon are conjunct with Rahu Ketu axis. Sound vibrations are conveyed through the “Vayu Tatwa”. Study of the directional strength of Mars, Saturn and Jupiter in One’s horoscope can vastly help in assessing what Music or Mantra would assist in optimizing his/her operational capability. Shukra could indicate the urge within oneself in this function. All energy resources are primarily “Agni tatwa” oriented . Saturn Moon combination enables inside link to galaxial powers commonly known as transcendental ability.this is otherwise known as “Akasha Tatwa”. Plantations provide valuable nourishment in the form of various chemicals, proteins, vitamins, etc. manufactured by them through the use of the Panch Bhutas, for all living creatures. Ability to utilize them properly is deﬁ ned by the position of Mercury and Jupiter in One’s horoscope. This is “Bhoomi Tatwa”. Where Duality or Dwaitam exists Ego ensues and it forms it invariably creates a negative force to the positive ﬂ ow of one’s energy in life. Competition leading to Animalism is the ultimate product. This causes malutilisation and loss of internal energy. Guru / Mercury combination and the constellation they run are indicators for rectiﬁ cation of this negative force. These are but a few of enormous functionaries that the galaxial combinations provide an intelligent occult anlyser to help human beings to optimize their natural internal power to facilitate better working of their Sensory Organs and Organs of Action and thereby enjoy a beautiful life journey. In the process (a) Unwanted Desires, (b) Arrogance,(c) Selﬁ sh Joy, (d) Depression, (e) Mental Turbulence and (f) Stubbornness,- all of which are energy dissipation ingredients are overcome and positive development ensues. Beneﬁ ts Accruing from above efforts:- To all endeavours there needs to be a positive beneﬁ cial output to create an urge in the everwanting human being.The Gita appreciates this and not only states that Peace and Harmony within oneself – so quenched after is the outcome, but also indicates the following Gunas that ensues and indicates whether you have succeeded in your endeavour :- Amanithvam, adhambhitvam, ahimsa, kshantir arjavm I Acharyopsanam,saucham,sthai ryam,athmavinigraham II Humility, unpretentiousness, non-injury, forgivness, uprightnessI Service of guru, purity, steadiness self analysis & control. All the above are self explanatory. Ahimsa means non-injury by thought or deed, Kshantir –to forgive without pleading , Acharyopsanam – we have something to learn from each other - therefore give a kind ear to what others say, saucham sthairam means purity should be continuous and long lasting and not for just instantaneous needs. These qualities will ensure that Self-Culture has developed and you are on the path to attainment of Supreme Bliss. This in brief indicates the precious directions that need to be followed by upcoming occult scientists that the Gita provides, for Welfare of Human Beings. 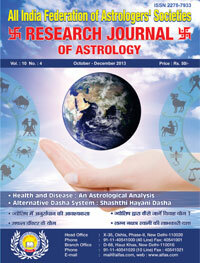 In this issue of Research Journal there are Research oriented articles on various topics like shasti hayani dasha, vastu & prediction technique.